All these and everything else, I thank and give HIM praise! Posted by donnalyn at 11/25/2009 10:10:00 AM 1 squiggly notes.. In life, we don’t plan for failure, sickness, heartbreaks and loss. In fact, they happen unexpectedly most of time. Sometimes we can handle them, other times they hurt so much, they leave us crippled and helpless. While others are strong and determined to rise and get going, others dwell in darkness and choose stay in the pit they are in. The former is always a better decision rather than being stuck in obscurity and remain miserable. Easier said than done, I agree but then again, everything happens for a reason. We fail so we can practice some more. It is embarrassing sometimes but giving up will only prove one’s failure. We learn from past mistakes and practice makes perfect. In time, we will master whatever skills we need to be successful in and realize that success is sweetest when it comes from faith in God, hard work and patience. We get sick so we can take care of ourselves better. We sometimes work too hard even if our bodies are likely to surrender. We prefer junk over the green healthy food just because they taste better. We shrug off the thought of exercise in our schedule, we choose to lazy around like we are always exhausted. Health is wealth but most often than not, it is taken for granted. We do not want for some sickness to make us realize how important health is, do we? We go through heartbreaks to experience love- be it to love or being loved. It may not always be a happy ending but be blessed with the opportunity of being in the relationship and all the laughter and tears that went with it. Continue praying for the right person, leave the doors open and God will surely send someone, who, He intends for you to spend your happily ever after with. Losing something we value or someone dear to us is a painful experience. When he takes something away, He replaces it with something better. Nonetheless, this is only applicable to something tangible. Losing someone we love is a whole different story. However we grieve and want to hold on, we have to let go and let God. Everything we have is His. We just have to be grateful He gave us the chance to build memories with our loved ones who are already called to be with Him for eternity. While we dread life’s unfortunate circumstances, we rejoice in every milestone of success, smile in a hint of recuperation, share hugs to show love and celebrate every victory won. But seldom do we realize that life’s catastrophes are purposely designed for our own good. We often get confused why things happen and the view doesn’t always look good at our perspective. Remember though, that He sees the bigger picture. He knows better and His ways are always higher than ours. We just have to trust in what He’s doing. Posted by donnalyn at 11/24/2009 05:17:00 PM 0 squiggly notes.. I made mention about this on a post after my birthday but I suppressed further details of it. Anyway, I had an appointment for my road test on that day but unfortunately and unexpectedly, the left brake light isn’t working. Thus, rescheduling is my only option. I wasn’t confident I’d pass but all I wanted was to be DONE with it. Waiting for a few more days only felt like prolonging the agony. I got my permit and insurance cards from the police officer and was asked if I wanted to set another appointment. Without any clue on how the problem could be fixed, I politely refused. I must make sure that the brake light gets fixed before another appointment needs to be CANCELLED AGAIN. While still in the office later that afternoon, I called hubby and he assured me that the brake light problem is nothing serious. The bulb can be easily replaced and dear Taurus wagon will be good to go. So I called DMV… I graciously reminded the police officer about our conversation earlier. I knew I was talking to the same one who asked me if I wanted to schedule another appointment. Sadly, I was dismayed to hear an angry irritated tone on the other line. This time, it’s him who wanted to have the brake light fixed before scheduling me for another road test appointment. Okay, okay… I understood his point but he can always say it in a nice way, right? On the next day… I called DMV again, this time hoping that it will be another officer picking up the phone. After a few question-and-answer from the line, another appointment was finally set for me. I was schedule to take the road test this morning. My plan was to come to the office early and get out for my appointment and come back to render the remaining hours. At the DMV office… I was nervous but pretended I was alright as we sat and waited for my turn. When my name was called, I went out and started the car as instructed. I silently prayed for a safe drive, recalled Bible verses and sang songs that have given me comfort in knowing that Jesus will be with me in everything I do. My cancelled appointment was supposedly on a gloomy afternoon. It rained as soon as we left DMV that afternoon. While the pissed human in me whined the disappointment away, my spirit settled in the thought that everything happens for a reason. I could have failed the test that day because: 1.) I always don’t mind turning the wipers on even when the raindrops have already blurred the windshield and 2.) I easily get tensed driving in the rain which leads me to commit a lot more driving mistakes. So really, what I have considered to be “not-so-good” could have been for my own benefit. I have been hoping forever to get my driver’s license and today, in His own time, I finally got it! Thank You Lord, I PASSED!!! Posted by donnalyn at 11/24/2009 05:06:00 PM 0 squiggly notes.. I love my hair. It may not be beautiful for other people but it is just the most precious for me. I regret to admit though that I have been ruthless in my purest intent to show it some love. It has become a subject to my fancy of well-advertised products as well as my research of home-made solutions. Supposedly natural, my most recent experiment was to go “no poo.” This simply means eliminating shampoo from my grocery and shower to-do lists. 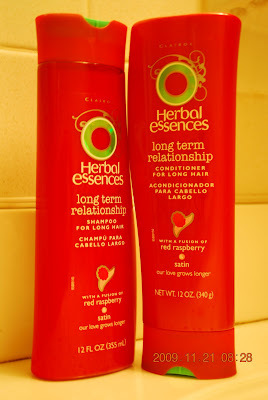 I know, it sounds absurd to take a shower without shampooing your hair especially a long one like mine. My modest investigation with Mr. Google wrapped up into settling on shampoo bars. While most reviews were positive, I was miserable with my own results. I gave it a grace period of a week to two, hoping it was just the adjustment phase. My hair was overly greasy and it felt dirty. I did not want to think of giving up since I ordered two shampoo bars so I thought I can find a way to get things right. A few more google searches suggested baking soda and ACV (apple cider vinegar) rinse. I was desperate so I was willing try everything just to thrive in going natural. Outcome was not the greatest, but at least, it wasn’t too bad as the previous. I went on alternating baking soda and the shampoo bar and did frequent ACV rinses. Though my hair was more manageable, I was unhappy. It was too oily for me, it felt nasty. I remained miserable freaking out when I comb my hair in the morning and see strands of my most precious on the floor or all tangled in my comb. I tolerated the effects of no poo for more than half a year until my birthday last Tuesday. I made up my mind and decided to go back to basic. 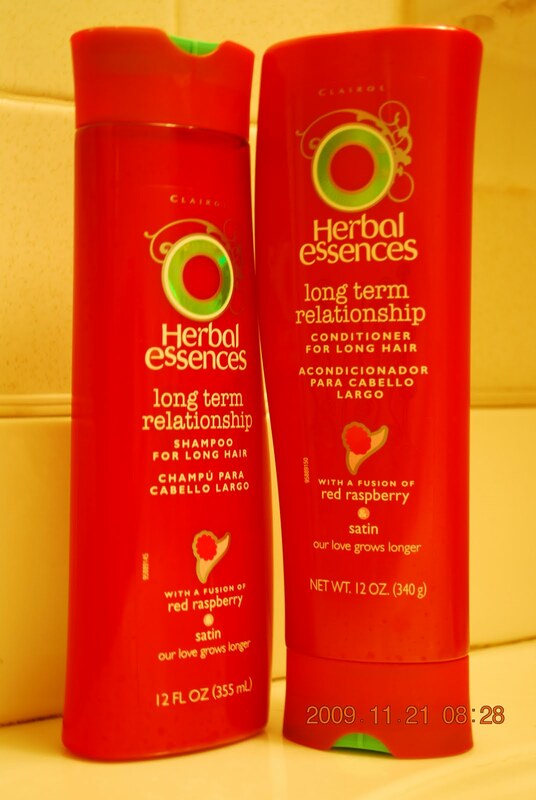 I grabbed Herbal essences shampoo and conditioner for long hair. My hair is soft, feels cleaner and smells way better. 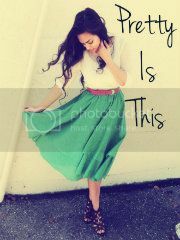 I am happy and hopefully so is my most precious. Posted by donnalyn at 11/20/2009 02:21:00 PM 2 squiggly notes..
Two things happened yesterday- the good and the not so-good. While I want to blog about each of them, I prefer to keep the latter to myself for now and promise to blog about it when the right time comes- that’s when my negative emotions have entirely lost its chances to flare up. - my new sewing machine. With hubby’s help, I managed to move things around our little apartment to give my dear makina a decent space. He also helped me complete the upper and lower threading to get me started. I ran a straight line stitch on a blouse I picked from a free box in the university for my practice which turned out pretty good (at least for me). My first project is to resize the sweaters I got from a sweet and kind lady from the church. Then hopefully I can work things around with the pretty skirts too. It already feels like too many of them to work on and too little time. And oh, I need to grab some stuff for my sewing kit! Posted by donnalyn at 11/19/2009 09:00:00 PM 0 squiggly notes..
That was 10 years ago. I was in the 2nd semester of my 2nd year in college patiently enduring the complexities of computer science then. While most teenagers plan and hope for a grand debut celebration, I envisioned mine to be one of those ordinary days in my life. I grew up with lechon (roasted suckling pig) almost always present in my birthday photos with most of my childhood/neighborhood buddies present in them. There were actually no games and prizes to make each celebration something exciting for us kids. All I remember is how my mom would personally organize and manage the menu for the party. She plays chef, my Aunt Celia is the assistant while I and my cousins were the little tasters of their masterpiece dishes and their official errand runners. Three or four of our Uncles play the butcher roles and two of them are in charge of roasting the suckling pig that will serve as the highlight of the celebration. The party starts with me, as the celebrant dressed in a beautiful birthday outfit, posing for a solo shot with all the food on the table. The fairytale-accented cake and the mouthwatering lechon are both scribbled with “Happy Birthday Donnalyn” on them. All my little guests will then surround me and the table for a group picture-taking. After a few more Kodak moments, everybody will sing “Happy Birthday” followed by the most awaited tsibugan (eating) time. I can picture almost the same scenario on my first teen birthday except that my guests were not so little anymore. I was then given the choice on how I would want my birthday to be celebrated on my next teen years which got simpler each year until my personal preference ended up to treat each supposedly big day of mine to be something ordinary. I went to college in a city far from my family and no birthday celebration is a good way to spare my stingy self from spending my own allowance. Reality is... that was 10 years ago- when life was a lot less complicated: when all I thought and be concerned about was to maintain a grade point average for my college scholarship, graduate on time and earn a good-paying job thereafter. As I look back, I see how I hurried myself up to get past that point in my life. Though no regrets, I wish that I had the kind of relationship I now have with Jesus as early as those days. When I laid myself to sleep last night, it finally sunk in to me- I am 28. The increase in my age goes to show in the kind of responsibilities I am dealing with and the concerns that give me great deal of anxiety at times. Life has been tough and still is. Mine is a drama of battles won and lost. Some remain to be fond memories but some needs to be buried to its grave. What keeps life going though is the fact that Someone up there sees me through all the highs and lows. Posted by donnalyn at 11/17/2009 01:33:00 PM 0 squiggly notes.. But there’s no way of stopping the time… Suffice to say, it is officially my birthday in Philippine standard time. Thus, some of my Facebook friends already sent their birthday greetings by either sending me personal messages or posting them on my wall. Thanks to Facebook for reminding people about it that will hopefully increase the number of my very few birthday greeters (*Lol*). “I don’t know” was my answer to friends and loved ones who asked me of my plans a few days ago. If asked the same question now, I will still give the same answer. I don’t have any big plans for my birthday except for prayer service tomorrow. What happens after that will be something impromptu. Happy birthday to me. Happy birthday to me. Happy birthday, happy birthday...Happy birthday to me... Somebody help me sing! I need to convince myself it's indeed already my birthday. Posted by donnalyn at 11/16/2009 02:41:00 PM 2 squiggly notes..
That's how I feel! I have been waiting forever for my sewing machine. 3, 2 and finally 1. One more sleep and I get to play with my new toy. Wednesday, it is! With much anticipation, I immediately tore the box open as soon as I saw my package sitting on a toddler table just beside our apartment door. I noticed the styrofoam broken but my agitation and desire to see and hold my new toy outweighed everything else. I held and cautiously positioned it on the table as if welcoming it with comfort to its new home. I got the most affordable and which I think, is most suitable for me, so simple yet elegant. As I meticulously inspected every bit of detail in it, I came across the very reason of my skepticism to place an order online. 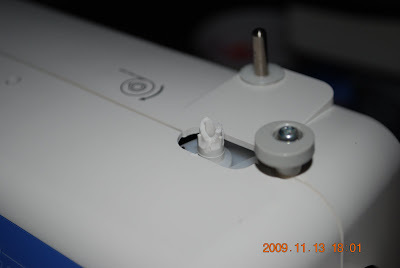 One small part (which the manual refers to as the bobbin winder) is broken. I immediately suspected UPS to be the culprit. They must not have handled the item with care. Posted by donnalyn at 11/13/2009 04:54:00 PM 0 squiggly notes..
That's a long title! I apologize, my brain is not working. I have this suppressed jealousy of apostolic girls wearing long denim skirts. I so love to own and wear one. Unfortunately, both my petite body structure and my cute height always give me a hard time finding one for myself. When I finally came across a website online, the skeptical in me took over my desire leaving me suspicious of the length of their skirts. Besides that, the prices plus the shipping and the handling fees are just too much for my budget. Given that fact, what-ifs toned with my creative imagination invaded my unused brain cells forming the idea of sewing my own skirts, dresses and perhaps tops. This put together a feeling of excitement in me resulting to days of online thrift hunting and nights of contemplation. First, I need to assess the feasibility of projects I intend to accomplish. Are they realistic enough considering my beginner capacity, time and funds? I searched for free skirts and dress patterns online which seemed easy so I gave this a big check on my note. If that is pretty easy, next one’s a bit harder. Which sewing machine suits me best? After reading recommendations and reviews, I opted to go for a used but still reliable one. Craigslist and Ebay did not offer a wide affordable selection so I checked on my last resort. Overstock sells refurbished items in very reasonable prices. A bit doubtful on second-hand items, I was torn between giving this an X or a check mark. While constantly thinking about my new found wish, I talked to Jesus in between. If it’s just a stubborn want, I pray that He will spare me from wasting money but if He sees it as my need then I pray that He will guide me to spend wisely. Funny, perhaps crazy, but through the course of my relationship with Him, I learned that I can be the silliest; the most stubborn girl that I can be yet He still listens faithfully and loves me regardless. As I was getting more serious about this, I considered another drawback. What about the fabric, the thread and such little bitty things I need for my projects? Will they cost as much (if not more) as buying actual clothes from Walmart or Target? I thought again. Maybe I should just buy clothes I really need than invest on a sewing machine and experiment for which I am not really sure of the outcome. After prayer meeting last monday, a sister from church approached me and told me she got some stuff for me. To my delight, it wasn’t just one but five of bags of her slightly used clothes. What a blessing! “You can have everything or choose whichever you like and bring the rest back to church so others can choose from them too,” she whispered as we hugged and bade goodbye. With much excitement, I immediately tried each blouse and skirt as soon as we got home. Most blouses and sweaters were too big (as usual) for me but a few skirts were my size- fits just right! I was so happy looking at the skirts I selected but was bit upset about not being able to pick any of the blouses especially the sweaters, which are what I need most for this chilly weather. I consoled myself with the thought that maybe someone else from church will be blessed with them. I went to bed with a heart overflowing with gladness and gratefulness for the free extension of my cold weather wardrobe. My thoughts formed into modest outfits- my new skirts paired with matching tops. My eyes heavy and sleepy, I started my journey to slumber land with the thought that I need not sew my own skirts now but the question where do I get these tops was at the back of my mind? Getting up late the next morning, I just picked a blouse I tried on the previous night which sitting on top of one of the bags. Looks big on me but I have no time to change and still hit my 8AM office time in. I was so conscious with what I wore to work yesterday. I kept looking at my blouse as I walked around the laboratory, the hallways and even when I sat on my office desk. I tried as much as I can to figure out on what should have been its size or what can be done to suit my petite-ness. A light bulb flickered into my almost dead brain giving me the brilliant idea of resizing it. This suggests the possibility of doing the same to the rest of the blouses and sweater that were too big for me. Then the concern of experimental sewing resulting to unwanted outcome will not hurt as much as buying new fabrics and everything else needed to sew my own tops. I searched for ideas on resizing sweaters and such online and realized how simple the steps were. 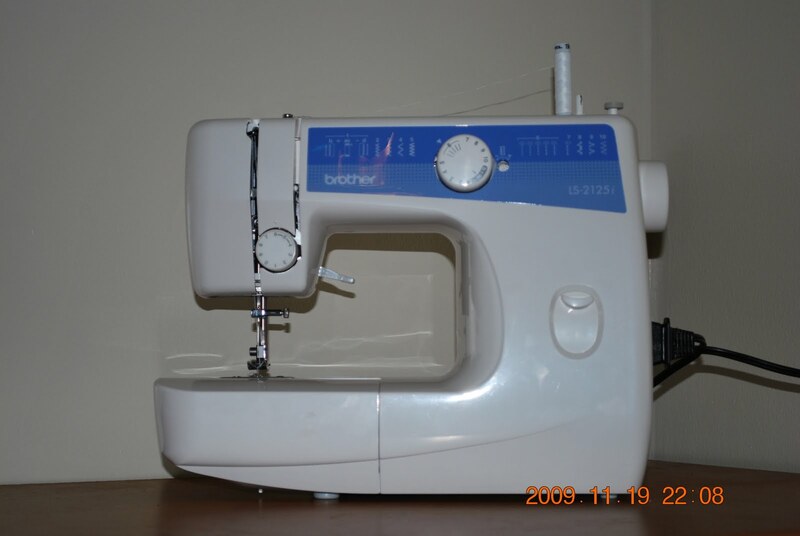 I went over all the used sewing machines I have been looking at since the last two weeks. I was all ecstatic to find one that fits my budget on sale. I took a deep breath and finally placed my order yesterday. Uh oh! That was one impulsive choice. I totally forgot to consult Jesus about it all. It just seemed that the heavens conspired to put everything in place for me to go for what I want. What to do? All’s done so I just hope I did the right decision. Posted by donnalyn at 11/05/2009 10:30:00 AM 2 squiggly notes..